The deplorable and unauthorized might of Child Protection Services is capable of reaching into and destroying any home in America. No matter how innocent and happy your family may be you are one accusation away from disaster. 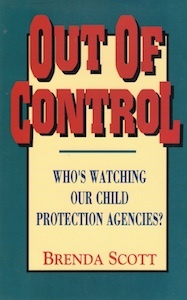 Brenda Scott’s book “Out of Control (Who is Watching our) Child Protection Agencies” is a book of horror stories and is true. These are not isolated incidents. Every year, it is estimated that over 1 million people are falsely accused of child abuse in this country. Social workers are allowed to violate constitutional rights. Innocent parents may appear on computer registers and be branded “child abuser” for life. You could be next, says author and speaker Brenda Scott.